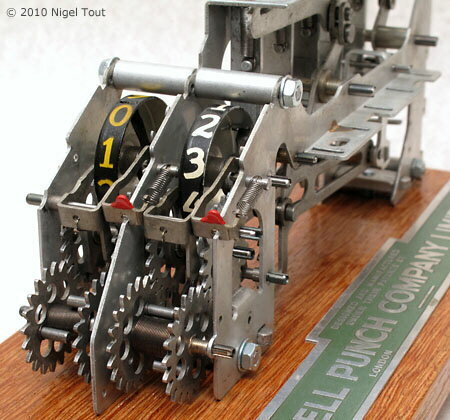 All of the mechanical calculators manufactured by Bell Punch were key-driven machines of the 'Comptometer' type. The Comptometer was invented by the American Dorr Eugene Felt and was patented in 1887. Manufactured by the Felt & Tarrant Manufacturing Company of Chicago, the Comptometer was the first truly practical and commercially successful adding machine. They proved very successful and were developed and manufactured by Felt & Tarrant and rival companies in large numbers into the early 1970s. A Model J, British Sterling currency (£sd), Comptometer. Manufactured in the USA by the Felt & Tarrant Manufacturing Co, in the 1920s-1930s period. 'Comptometer' eventually became to be used as a generic name for calculators of this type from other manufacturers, though strictly this is wrong. However, to complicate matters, in 1957 the Felt and Tarrant Manufacturing Company changed its name to Comptometer Corporation. Then in 1960 Comptometer Corporation sold its UK. operation, including the right to the Comptometer name in Britain, to Control Systems Ltd., the parent of Bell Punch, which merged it with its own company to form Sumlock-Comptometer. Comptometer Corporation then contracted with Control Systems to have all its machines made by Bell Punch in England and shipped back to the U.S.A. This resulted in all Comptometer production ceasing in Chicago in 1961, and in machines from Sumlock being marked with the Comptometer name. The Comptometer was the first successful key driven adding and calculating machine. "Key driven" means that just pressing the keys adds the numbers entered to the total - no other action is required - so it is very quick for adding long lists of numbers. The basic function of the Comptometer is addition. There is a column of keys (in general 1-9) for each decade. When a key is pressed, that number is added to that decade, with carry to the next higher decade, if applicable. Operating the handle clears the total to zero. Comptometers are very fast in operation when adding up lists, such as required in accounting. Operators were specially trained to make use of the full keyboard and enter each number by pressing all the digits in one go using all fingers, as necessary, at once. In other words all the digits were entered in parallel, the mechanism being able to cope with this. In contrast a modern electronic calculator only has 10 digit keys so the digits of each number have to be entered one at a time, serially, which is slower. Comptometers were widely used into the late 1970s and were ousted by advances in the use of computers for accounting rather than the development of electronic calculators. People trained in the proper and swift use of Comptometers often kept using them into later years for adding up lists since they are quicker than a standard ten-key electronic calculator. Although these machines were very successful and thousands were sold, only a few companies manufactured the 'Comptometer' type of calculator. The main manufacturers were Felt & Tarrant (later Victor Comptometer) and Burroughs in the U.S.A., and Bell Punch in Britain. The Bell Punch company did not manufacture any calculators until the 1930s when in 1936 the parent company, Control Systems, acquired the rights to the adding machines of the Comptometer type manufactured by Petters, Limited, of Yeovil, England and sold under the name 'Petometer'. Due in part to the use of the old £sd Sterling currency and imperial units of measurement in Britain and the British Commonwealth, Bell Punch manufactured a greater variety of 'Comptometer' type calculators than any other company. The early Petter based models were introduced by Bell Punch in about 1937 under the name 'Plus Adder'. An early Plus Adder, with 'abbreviated' keyboard (only having numbers up to 5 in each column). In 1940 a larger, full keyboard (with numbers 1 to 9 in each column), machine under the name 'Sumlock" was added to the range, and a separate company, London Computator Corporation, Limited, was incorporated to deal more efficiently with the sales side of the calculators. An early Sumlock machine, distributed by London Computator Corporation. 1939 - Plus [this date may not be accurate since the Plus Adder is listed in the German book "Die Rechenmaschinen" published in about 1937]. 1940 - Sumlock Mark I. 1946 - Sumlock Mark II. 1950 - Sumlock Mark III. 1952 - Sumlock Mark IV - Figureflow. The last new models of Bell Punch mechanical calculators, the 993 series, were introduced in 1964. Plus models were manufactured by Sumlock Anita Electronics into the 1970s. 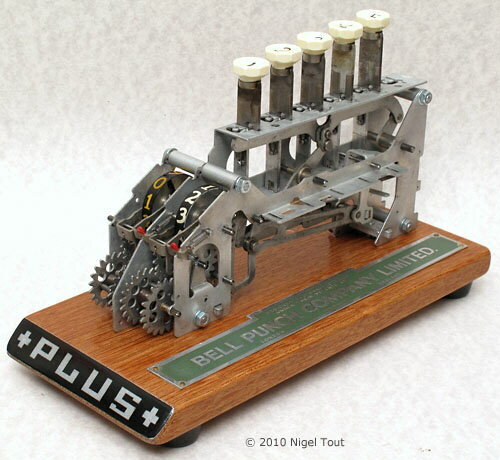 Bell Punch were the world's largest producer of 'abbreviated' 'Comptometer'-type calculators with their 'Plus' range. Having columns with keys only up 5, these were cheaper, smaller, and lighter than full-keyboard machines and with little or no speed penalty. The 'Plus' machines are designed purely for adding operations, while the 'Sumlock' and 'Comptometer' models have keys marked also with the nines-complement numbers and have 'prevent carry over' buttons for use with subtraction operations. For details of performing calculations on a Sumlock Comptometer see the article on the sister site to this. Sales brochure for Plus machines (pdf format), from about 1948. X is the number of rows of keys, and YY is the number of columns of keys. Z is one or more letters to give the type of calculator. 4AH - Seen on Figureflow models. C - A decimal machine with the key columns in colours suitable for use with Currency calculations (that is the keys in the two right-hand columns are in a matching colour). Example 509/C. CK - Decimal Currency machine with unknown extra functionality - if you know of this functionality please get in touch. CNK - Decimal Currency machine with unknown extra functionality - if you know of this functionality please get in touch. CP - As an extra designation letter group before the others, it indicates a 'Certopost' machine. Example 913/CP/S. D - Decimal calculator (that is the keys in the three right-hand columns are in a matching colour). Examples 506/D, 509D. F - Sterling (old British £sd) currency calculator with Farthings (1/4 penny) keys. Examples 506/F, 509/F. HD - Decimal calculator with also a Half (1/2) key (useful for British decimal currency in the early days). KL - As an extra designation letter group before the others, it indicates a machine with a button (red, at top right) to release the Keyboard Lock mechanism, used on some of the earlier machines. Example LC/509/KL/SF. LC - As an additional designation letter group before the others, this indicates an early machine marketed by the London Computator Corporation, a division of the parent Bell Punch Company. Examples LC/509/S, LC/912/S. LD - Decimal with round-off feature. Example 509/LD. MD3 - Appears to be Decimal with unknown extra functionality - if you know of this functionality please get in touch. R - Pre-decimal currency used in the Indian sub-continent (1 Rupee = 16 Annas, 1 Anna = 12 Pies). S - Sterling (old British £sd) currency calculator. Examples LC/509/S, 509/S, 512/S, 912/S. SF - Sterling (old British £sd) currency calculator with Farthings (1/4 penny) keys. SP - Special ? Found on an Imperial weight calculator (tons, hundredweights, quarters, 7 pounds). Example 509/SP. T - Time calculator (hours and minutes). Examples 506/T, 509/T. V - As an additional designation letter appended to the others, it indicates a machine powered by an electric motor (V = Volts ?). VB - As an additional designation letter group appended to the others, it indicates a machine powered by an electric motor (V = Volts ?). Seen on 993e machines. VI - As an additional designation letter group appended to the others, it indicates a machine powered by an electric motor (V = Volts ?). VB - As an additional designation letter group before the others, it indicates a machine powered by an electric motor (V = Volts ?). Y - Imperial weight calculator (tons, hundredweights, quarters, pounds). Examples 509/Y, 912/Y. The model designations of these machines are not fully understood but from evidence are as listed. If you have material which clarifies these model designations please get in touch. With the introduction of decimal currency in the Britain and the Commonwealth, Sterling currency machines were often converted to Decimal, either officially or unofficially. Often these machines retain their original type designations. Other discrepancies are sometimes observed. Converted machines. When Britain and the Commonwealth changed from the old Sterling £sd currency to decimal currency the Sterling currency machines could still be used by ignoring the shillings and pennies columns. However, on machines with few columns to start with, such as the 509/S, this does not leave many useful columns. It appears that to overcome this it was common to modify Sterling currency machines by replacing the shillings and pennies columns with decimal columns, since such modified machines are sometimes seen. This involves drilling extra holes in the top and fitting the decimal keys and mechanism from another machine. Such machines appear to be decimal, may have some blanked off key holes, have a serial number including /S, and usually still have the yellow lines on the accumulator register which separated the £sd sections. This may not have been an official modification since examples seen are often somewhat crude. For an example see the Plus Adder D (converted). The Plus machines changed to a more angular design in early 1958. For Plusograph see the Calculators made by others section. The "Petometer" - the forerunner to the "Plus Adder". Bell Punch bought the design and rights of this machine in 1936 from Petters of Yeovil. It was the basis for the development of the "Plus Adder". Large "Plus Adder" with thin sheet metal casing, again with the mechanism operating on the downward strokes of the keys. Was the sheet metal casing a war-time economy measure, releasing Bakelite for more important uses, or was it a quick way to meet demand for a 12-column machine without going to the expense of making the tooling for the larger bakelite moulding? If you have any information about this please let me know. In the original mechanism the total is advanced as a key is depressed. However, it was found that an errant finger of the operator using the machine quickly could slightly depress an incorrect key and lead to the wrong total. In the improved mechanism the total is advanced as the key is released. So overcoming the above problem where the total is altered when a key is incorrectly touched. There is yet another problem where a required key is only partially depressed, again leading to the wrong total. Interlocking was added to the mechanism so that if a key was not fully depressed then it stayed in the position to which it was depressed and the rest of the keys were locked to prevent them being pressed. The operator then had to identify the key which was not fully depressed and press it all of the way. On some models a red button had to be pressed to unlock the rest of the keys, though later the mechanism was developed so that this was not necessary. Later, "London Computator Corporation", version with die-cast metal casing with black plastic handles. Die-cast metal casing version produced in the 1950s, with painted steel strips between the key stems. More angular, single-piece die-cast metal casing version, introduced in 1958. The cylindrical keys protrude from circular holes in the casing. Beige paint colour appears to have been used from the mid 1960s. In the early 1940's Bell Punch introduced a full-keyboard machine under the Sumlock name which was sold by their London Computator Corporation marketing company. The name refers to the interlocking of the mechanism to prevent incomplete key strokes (the key does not return, and no other key in the same column can be depressed, until it is pressed far enough). In 1950 the name of the marketing company was changed to Sumlock Ltd. Sales brochure for Sumlock machines (pdf format), from 1947. London Computator Corporation 'Sumlock' full-keyboard machine. 1940s. In mid-1960 Control Systems Ltd. (the parent of Bell Punch) acquired the English operation of Comptometer Corporation (previously the Felt & Tarrant Manufacturing Company) of Chicago, U.S.A., including the trademark and the right to the 'Comptometer' name in England, and then signed a contract with Control Systems to have all their machines manufactured in England. Sumlock machines then appeared under the Comptometer label. Below is a demonstration model of the later, more complicated, interlocked mechanism. To minimise incomplete key strokes the key does not move the gear wheels on the downwards stroke, but lightly triggers the mechanism to move the gears on the spring-driven return stroke. Also there is interlocking to prevent inadvertent pressing of two keys in the same column. Once a key is depressed by a small amount all of the other keys in the same column are locked and cannot be depressed. Bell Punch produced these demonstration models. They could be used to show customers how the interlocking mechanism worked, so making the machines less liable to operator error. Progressively to the back of the mechanism (that is to the right) the keys push further down the lever with the sector gear on its left end. When the key is released the lever moves forwards, the sector gear engages with a gear at the front and move the number drum on accordingly. Keys are interlocked and do not return unless they are pressed fully down. No other key in the column can be pressed until all keys in the column are back fully upwards. The accumulator drum and the carry mechanism. 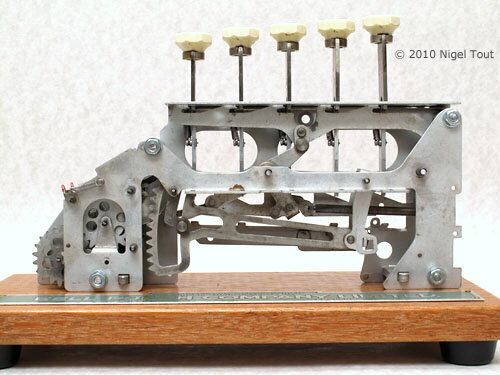 There are excellent photographs and descriptions of the later Plus Adder mechanism at John Wolff's Web Museum site. These are accessed from the Comptometers and Key-Driven Calculators section on that site. "News File", Office Magazine, May 1958, p406.